Did you know that there has been at least one dividend cut announcement on each and every single trading day in February 2016? It's true! The only weekday that didn't have one was Monday, 15 February 2016, which didn't have one because U.S. markets were closed for trading for the President's Day holiday. 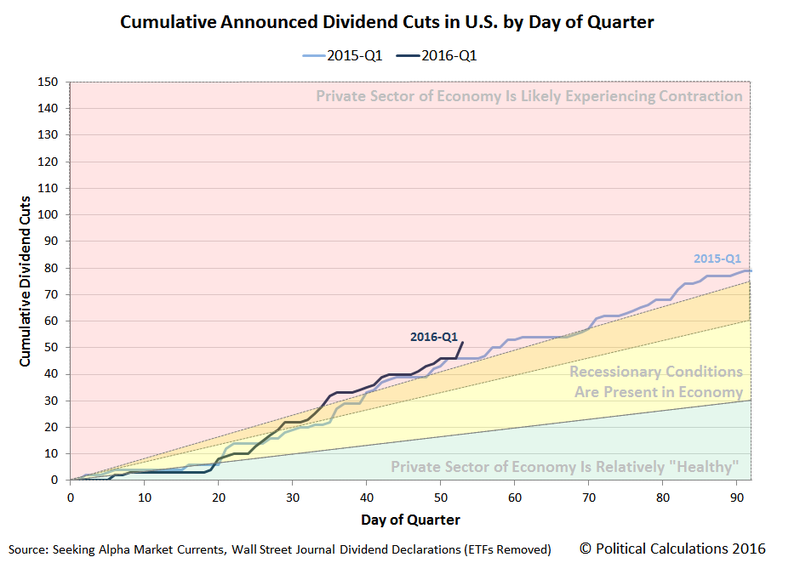 Of course, another way to describe what the chart shows is that the number of dividend cuts in 2016-Q1 is running a week ahead of the pace set in 2015-Q1, which is also to say that its worse than in 2015-Q1. Right now, our unofficial count of dividend cuts for February 2016, as of 22 February 2016, is 30. Of these 30 firms, half are in the oil and gas producing sector of the U.S. economy, 4 are in the financial industry, 3 are in high tech, 2 are in the chemical industry (or really the agriculture industry since both firms make nitrogen-based fertilizer products), and there is one each for the industrial sectors of biotech, manufacturing, services, shipping, mining and real estate. But you don't have to take our word for it. Here's the list to-date for the month: PDL BioPharma (NASDAQ: PDLI), Twin Disc (NASDAQ: TWIN), Rent-A-Center (NYSE: RCII), Apollo Global Management (NYSE: APO), ECA Marcellus Trust I (NYSE: ECT), Northern Tier Energy (NYSE: NTI), ConocoPhillips (NYSE: COP), Chesapeake Granite Wash Trust (NYSE: CHKR), Symantec (NASDAQ: SYMC), Sabine Royalty Trust (NYSE: SBR), Ardmore Shipping Corporation (NYSE: ASC), Bristow (NYSE: BRS), Anadarko Petroleum (NYSE: APC), Alon USA Partners (NYSE: ALDW), Precision Drilling (NYSE: PDS), Carlyle Group (NYSE: CG), Energen (NYSE: EGN), KKR (NYSE: KKR), Devon Energy (NYSE: DVN), Ingram Micro (NYSE: IM), Rentech Nitrogen Partners (NYSE: RNF), CVR Partners (NYSE: UAN), Yamana Gold (NYSE: AUY), GAMCO Investors CL A (NYSE: GBL), Cross Timbers Royalty Trust (NYSE: CRT), Enduro Royalty Trust (NYSE: NDRO), Magic Software (NASDAQ: MGIC), Enerplus Corp (NYSE: ERF), First Potomac Realty Trust (NYSE: FPO), and Mesa Royalty Trust (NYSE: MTR). That's a big change from January 2016, when all but one of the 22 firms whose dividend cuts we sampled were in some way tied to the U.S. oil and gas industry. The distress in the U.S. economy is becoming more diversified. And there are just 5 more trading days left to go in February 2016! Seeking Alpha Market Currents. Filtered for Dividends. [Online Database]. Accessed 22 February 2016. Wall Street Journal. Dividend Declarations. [Online Database]. Accessed 22 February 2016.